One of the most frustrating experiences for dog owners is contacting a sitter who has marked their calendar as available, only to discover that they are actually unavailable. Maintaining an accurate calendar is the best way to make a great first impression on dog owners, and is one of the keys to success on Rover! That’s because accepting requests that match your calendar availability and preferences improves your chances of getting more requests in the future. While dog owners typically request services two to three weeks in advance, you’ll also receive a mix of short notice requests--“I need a dog sitter this weekend,” and requests further out into the future--“I need a sitter in two months.” Since requests can come at anytime, it’s crucial that your calendar is kept up to date. Your calendar availability defaults to the days you said you were generally available and to the services you said you would like to offer when you originally created your sitter profile. 1. Select the day you want to edit on your calendar, or click and drag your mouse to edit multiple dates at once. 2. A popup window will appear. You can choose to edit each service individually and select Save. Or, if you won’t be available for any services, just select Mark all services as unavailable. To reset the number of spaces you have to your default number of spaces, select reset to default. 3. Your edits will now reflect on your calendar. For more tips and tricks on how to manage your calendar, check out this article. What services can you realistically offer? Did you originally mark that you could provide all services, when really you’ll generally only be able to provide one or two? If so, make sure to update what services you can offer, so you don’t end up turning away requests that aren’t compatible. How many dogs can you comfortably host? To start, we recommend that you accept fewer dogs until you get the hang of things. 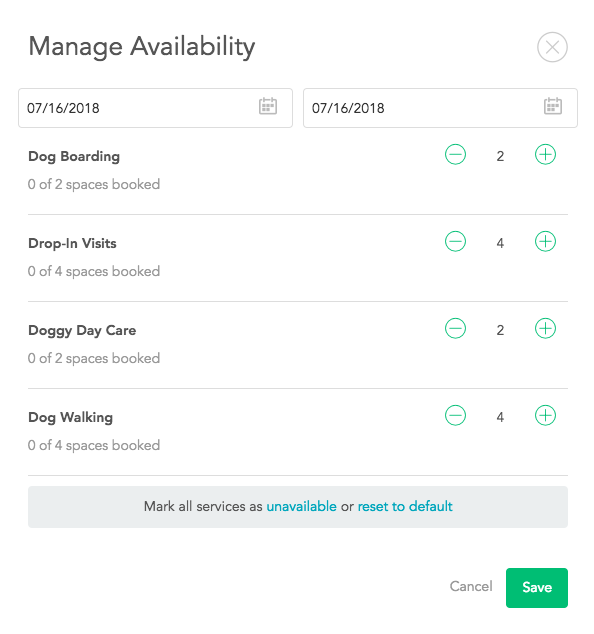 You can adjust your service preferences, including how many dogs you’d like to care for at a time here.